Of course, Künker will gladly help you in establishing the value of you coins, including cases in which it is desirable to answer numismatic questions about your coins through an official expert opinion. We work in this sphere with international specialists, the leading museums, and many scientific and academic institutions, and will gladly assist you in seeking the proper contact person for your technical questions and thus in establishing the exact value of your coins. 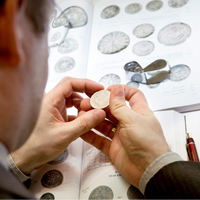 We will happily issue an expert report for you through our IHK-authorized and -inaugurated expert for coins of the Middle Ages and the Modern Era, Dr. Hubert Ruß. The offer applies for both legal and private commissions.